Service Costs > How Much Does Professional Carpet Cleaning Cost? Once you get your carpet installed, it is a good idea to do your best to keep it clean. While you may be able to clean up a spill on the surface and no longer be able to see it, there is most likely still residue from the spill deep in the carpet. As the carpet gets worn down, this may become visible – especially if the spill is in a high-traffic area, and in order to keep your carpet as clean as possible, you should schedule a carpet cleaning about once a year. This can also help remove any germs or allergens in your carpet, keeping your home clean and healthy. Having all the carpets in your house cleaned will depend on how many rooms you have that are carpeted as well as if you have any carpeted staircases. In general, a full house carpet cleaning will cost between $100 and $400. Most companies will have a minimum that is usually around $75 to $125. Services, such as Stanley Steemer, charge a certain price per room. This price is not a fixed amount, however; the more rooms you have cleaned, the less it costs per room. For example, to have three bedrooms and a living room cleaned, it will cost $136. Adding a staircase to this will raise the price to $159. 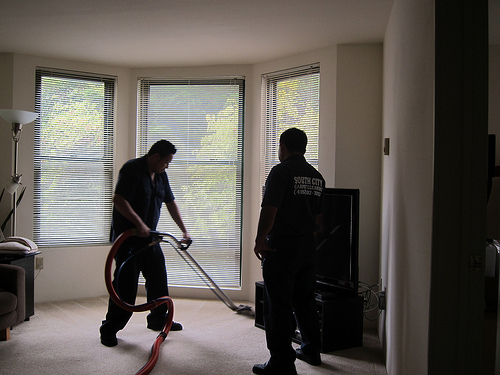 To have the carpet cleaned per room, the prices can range anywhere from $15 to $55. This will all depend on the size of the room. If you wanted these same four rooms and staircase protected from future stains as well, your total price will be $238, and if you also want to have them deodorized (a good idea if you have pets), your total will be $317. Another option for carpet cleaning is to rent a portable carpet cleaner and do the work yourself. You can rent the Rug Doctor for $25 per day, for example. You will also need to purchase all the cleaning products in addition to this. According to the Rug Doctor cost calculator, you can save about 60% by doing the work yourself. The downside is that the portable cleaners do not do as good of a job, nor do you have much experience cleaning carpets. CarpetSuperSite.com recommends you budget about $0.18 to $0.36 per square foot. Most companies will ask you to remove anything breakable or valuable from the rooms being cleaned, but they will take care of moving the furniture. Any visible spots will be pre-treated in order to remove them with ease. Carpet will be steam cleaned, usually using very hot water mixed with cleaning components. Any protectors or deodorizers will be applied if requested. Furniture should be moved back, usually with protective pads underneath. The average room will take about 15 to 20 minutes to clean. The dry time will be affected by the humidity levels, but on average, be prepared to wait eight to 24 hours to allow the carpet to dry. Because most cleaning estimates are given over the phone, the price may change once the company arrives. If your carpet is excessively stained or dirty, there may be an extra charge. If you live higher than a third floor or if there is no accessible parking for the cleaning van, there will be an extra charge for a portable machine. Stubborn pet odors or stains can be removed for an additional $50 to $125 per room. This will depend on the severity of the stain. Stains that are hard to get out may require a special cleaner. If this is the case, an additional fee may apply. Other problems such as pet odors can increase the price as well. If there is extensive furniture that has to be moved, the carpet company may note this as an additional expense. Stairs are ideally going to cost more if they have carpet that needs to be cleaned. Plan on spending an additional $40 to $75 per room. If the stain is on the carpet steps, it can be an additional $3 to $5 per step. If you want to add Scotch Guard protection, which adds an additional layer of protection, can cost an additional $5 to $15 per room. Carpet cleaning companies can also clean furniture as well. If this is the case, the prices can vary anywhere from $5 to $100 depending on the size and type. Area rugs can cost extra. This is about $25 per rug. Moving furniture may be an additional cost. Usually, the dirtier your carpet is, the more it’s going to cost you. For example, think of a stove top with a lot of grease and dirt build up. Carpet companies are going to look at your carpet the same way. Carpets that receive a decent amount of traffic should be professionally cleaned at least once a year. It’s always best to call up a carpet cleaning company when the carpets are starting to look a tad dirty. It’s best to get the cleaners in before more damage is done to the floor. Consider signing up for a regularly scheduled cleaning. Not only can you get a discount by doing this, it can maintain your carpet for a longer period. Pay close attention to your carpet’s warranty because if the carpet isn’t cleaned according to specifications, you may void the warranty. Don’t expect miracle results. If the carpet is worn out and old, some stains will be impossible to remove. A carpet cleaning company will generally be able to tell you if they can remove it before they start. Many companies offer discounts for frequent users and loyal customers. Most companies have “sales,” especially during holidays when people are more likely to have company. If you want to get your furniture cleaned, try to get everything done at once; this way, you can save on the minimum fees and get the best deal possible. Consider using HomeAdvisor.com to help you locate carpet cleaners in your area. Here, you can input your information and receive multiple quotes for free. There are many companies that place ads in the paper and run television commercials. Look for these ads and call on them, especially since they are usually advertising a special price.